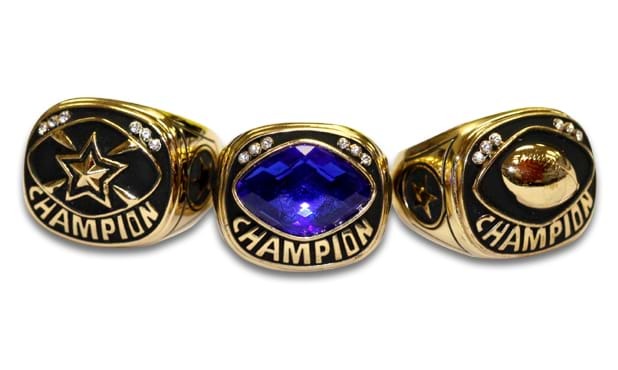 These heavyweight champion rings have a bright gold finish and come complete with either a dimensional sport inlay or a coloured glass stone in the center. Sport inlays available are: Baseball, Basketball, Bowling, Cheer, Football, Golf, Martial Arts, Soccer, Star, Tennis, and Wrestling. Glass stones are available in: Blue, White, Green, Pink, and Red. Please specify insert choice when ordering. The rings have attractive shoulders with a star design on each end. They come individually boxed.